But when a new case takes her back home to Barrens, Indiana, the life Abby painstakingly created begins to crack. Tasked with investigating Optimal Plastics, the town's most high-profile company, and economic heart, Abby begins to find strange connections to Barrens’ biggest scandal from more than a decade ago involving the popular Kaycee Mitchell and her closest friends—just before Kaycee disappeared for good. With tantalizing twists, slow-burning suspense, and a remote, rural town of just five claustrophobic miles, Bonfire is a dark exploration of the question, can you ever outrun your past? Krysten Ritter, who plays Jessica Jones on the Netflix series, wrote a novel. It's not bad, either. 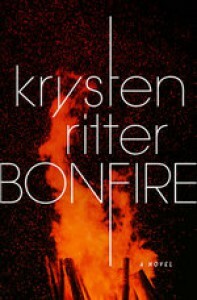 Bonfire is compulsively readable or listenable, considering I did listen. The mystery is atmospheric and layered. The characters are clearly flawed. On the surface, it reads like another small town girl who was tormented in high school returns home to face her enemies and bring down the company that is her hometown's savior…Erin Brockovich style. Then somewhere along the way it turned into something much more lascivious and diabolical than poisoned water. While not without its flaws, and despite my confusion with the MC's constant state of drunkenness and her dreamlike memories that come to surface whenever she is in this state (it seemed to me that she never remembered how she came to be drunk in the first place), I found this to be an engaging read. After my last two Audiobooks, I needed something that I would like, and this stepped up to the plate. Narration~ My Grade for the narration by Karissa Vacker is a B+, I found her voice is easily listenable.